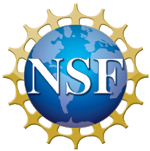 As part of the National Water Quality Assessment Transport of Anthropogenic and Natural Contaminants to Public-Supply Wells topical study, the U.S. Geological Survey investigated factors contributing to the susceptibility of public-water supply wells to contamination in different geologic and geochemical settings. This investigation included: sampling and analyses of water quality of wells; identifying redox conditions in the surrounding aquifers; and using numerical models to delineate areas contributing recharge to wells and to quantify the distribution of travel times through the groundwater systems. 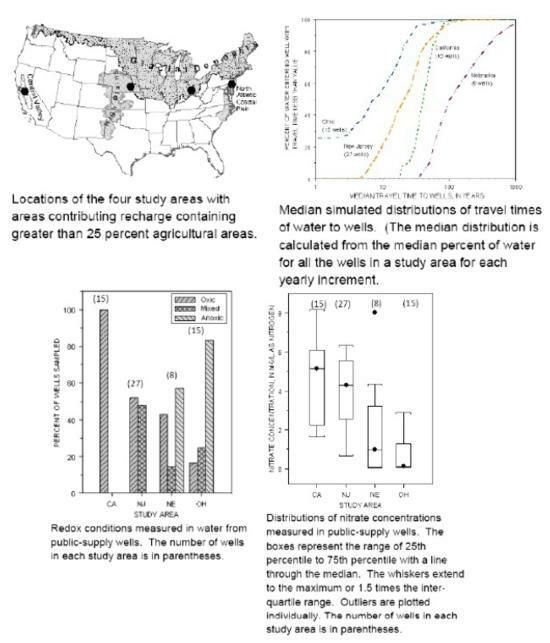 Wells are located in four study areas: (1) deltaic and marine deposits in the coastal plain of New Jersey; (2) basin fill deposits in California; (3) glacial valley fill deposits in Ohio; and (4) alluvial deposits in the high plains of Nebraska. These aquifers have areas contributing recharge that on average include more than 25percent agricultural land, leading to increased concern over agricultural-water quality problems. These four study areas are all in highly productive aquifers composed largely of sand and gravel with some smaller amounts of clay and silt. Differences in the aquifer geometry and materials as well as recharge amounts lead to differences in groundwater travel times to and redox conditions of public-supply wells in the areas. A dissolved oxygen value of 0.5 milligrams per liter was used to classify wells as oxic or anoxic, however when there was dissolved oxygen present above this threshold along with elevated levels of iron and (or) manganese, the well was classified as mixed. A natural attenuation factor for potential contaminants, based on travel time through each redox zone and the expected degradation rate of the contaminant in the redox zone, can be determined for each well. This natural attenuation factor was used as a measure of susceptibility of the public-supply wells to contamination. Well construction and the timing of pumping also can affect the susceptibility of wells to contamination by altering the travel time through and (or) redox conditions in the surrounding aquifers. Travel times are generally fastest in the Ohio and New Jersey study areas. Redox conditions in the water from public-supply wells are generally oxic in the California study area, oxic or mixed in the New Jersey study area and mixed or anoxic in the Ohio and Nebraska study areas. Nitrate is a useful indicator for agricultural contamination because it is applied over most agricultural land. Although travel times are fastest in Ohio, part of the paths are often through anoxic zones where the nitrate will readily degrade. In contrast, in New Jersey and California travel times are higher but the flow is largely through oxic zones where nitrate is persistent resulting in a lower natural attenuation capacity. Measured nitrate concentrations are highest in the California and New Jersey study areas corresponding to lower simulated values of natural attenuation capacity for nitrate. Other agricultural contaminants, such as pesticides might have different degradation properties related to the different redox zones so it is important to understand the natural attenuation capacity for a range of degradation rates.